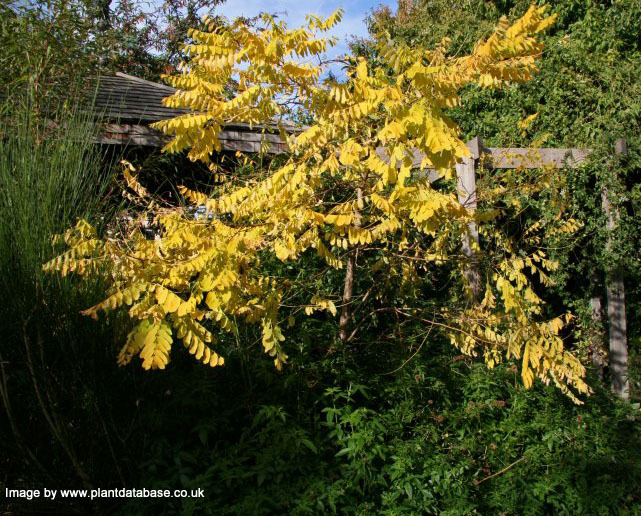 Spectacular , butter-yellow foliage turning yellow-green in summer, turning to amber in autumn, with clusters of scented white flowers in late-spring and early summer mark out the False Acacia Frisia (Robinia pseudoacacia 'Frisia') as one of the most attractive and popular trees. This fairly columnar tree makes an excellent choice of tree for a sunny, surburban garden. Its pea-like pods were likened by some to resemble locusts, hence the name Black Locust tree. It is best to shelter it from strong winds and avoid disturbing the roots, since the tree is prone to suckering. A medium sized tree, expect a height of up to 6 metres (20 ft) after 10 years. 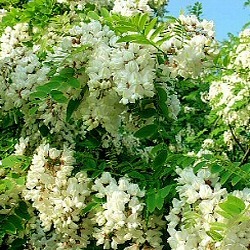 This tree is supplied at a height of between 1.5 to 2.4 metres in a 10-15 litre container for year round planting and better results than from bare-root or rootballed stock.